Few aircraft have been as successful in combat as the F4U Corsair. The innovative “gull wing” design was first introduced in 1938. The design allowed for less drag and a shorter landing gear than the huge prop would have allowed with a straight wing aircraft. However, due to complexities in development and production of this new and innovative aircraft, the Corsair wasn’t used in combat until 1943. Thus the more conventional F6F Hellcat beat it into combat and into deployment on the Carrier fleet. At first the Corsair was difficult to land on an aircraft carrier. They earned the ominous nickname of “Ensign Eliminator” due to the dangerous stall that could occur at slow speeds if the pilot wasn’t careful with the throttle. Thus the first operational Corsairs were given to the Marines and flown from land bases. The Corsair proved to be a superior fighter to anything the Japanese had and it quickly earned a reputation among pilots as rugged and worthy fighter. Eventually the bugs were worked out and Corsairs were deployed to the fleet carriers of the USN and Great Britain where they served with great distinction. Later variants would serve in the military forces of many different countries up until the 1960s. This new kit represents the first operational Corsair, the F4U-1. It is easily identifiable by its birdcage style canopy. Tamiya has been setting the standard for quality WWII era kits in 1/32 scale for a few years now. The Spitfire Mk 9 kit and the P-51D mustang kits were both highly anticipated and didn’t disappoint. This latest release shows that Tamiya has learned some from their previous releases. Anyone who has seen either the P-51 or Spitfire Mk 9 kit will feel familiar with the elegant moldings, and features that Tamiya as provided. If you got the export version of this kit you are provided a copy of Sprue G molded in clear plastic. This is the tree that holds the parts for the engine cowling. 17 Sprues molded in light grey plastic. 1 sprue molded in clear plastic. 2 sheets of steel photo etch. 55 page instruction book printed in black and white. 1 sheet of canopy masks. 1 Decal sheet featuring markings for Ken Walsh’s “DaphneC” of VMF-213, another Marine Corsair of VMF-215, and the USN Corsair of James Halford of VF-17. 1 Decal sheet of stencil markings. Full color painting guild for the camouflage markings of the tri color VF-17 bird. 11 page reference book which features many color photos and descriptions of various models of the Corsair starting with the F4U-1 through the F4U-4. Now I am modeler, not a historian. Don’t get me wrong, I’m certainly interested in history, and building my model as accurately as I can. However, I don’t normally compare parts to plans unless something looks wrong. At this point I can’t tell much about how it looks. My only reference on that is other people’s builds. From what I have seen it most certainly looks like a Corsair. I also can’t tell how it all fits together but from what I can see in the box the kit looks fantastic. The first thing you notice when looking at this kit is that the molding quality and level of detail is astounding. The panel line details are very crisp, rivets and screws cover the airframe, but are so finely produced that the modeler will have to take care not to completely erase their presence. The cockpit appears to look very good right out of the box. Tamiya provides trim tab wheels in clear acrylic, just like the ones on the real plane! Tamiya provides the “main” parts of the pit and have not attempted to model any of the very complex system of hydraulic pipes, hoses, and wires that run all over in the front pit. I’m very glad of this as if one is looking to add this detail, this will be a good place to start rather than scraping off unrealistic molded on lines. If you don’t feel like doing extra work here it should still look pretty good due to the pit being fairly dark. The foot supports also should have an open hole in part that forms the support with the fuselage. The photo below shows the flashed over hole will be easy enough to hollow out. One thing I do not like is the steel seat belts. I wish Tamiya had just provided the buckles and let me make the belts out of paper. Typically steel belts are extremely hard to use and don’t end up looking particularly good. I will not be using the kits seat belts, your results may vary. The instrument panel is gorgeous and has the same type of construction sequence as was used for both the Spitfire and the P-51. A clear piece forms the dials and a backwards printed decal shows the instruments through the glass and will look great in the assembled pit. I feel the throttle quadrant and some of the other levers are soft and not very complex but I’m sure once painted they will look nice. A won’t complain too much about that though, besides either making your own, or aftermarket will surely be available which will address the worst of these parts if that truly bothers you. The clear parts are exquisite, and the design of the forward canopy is much like the one in the P-51 kit. It’s molded so that you will join the canopy on panel lines away from the clear parts of the canopy. This is a great design feature of Tamiya kits that I absolutely love. As nice as it is, there are a few noticeable ejector “pin” marks inside the fuselage where the cockpit and tail gear bay, but nothing surprising or serious there. Filling these little pin holes will be fairly easy as the spaces they are in are not such that you will have trouble fitting a sanding stick to get to them. One little thing I did notice. Tamiya has provided positional control surfaces, however, the control stick is molded in the neutral position and moving the stick to a realistic position to match the controls won’t be a trivial matter. If you plan on building this kit out of the box only, you might want to plan on leaving the controls at dead neutral. Tamiya has engineered this kit so it will be fairly easy to position the wings up, or down (or one up and on down – yes they could be positioned like that). Also, a really nice feature is either flaps up, or flaps down. While it’s true that the flaps up position is the most often seen in a parked aircraft, those who want to can just as easily put the flaps so they are in the down (landing) position. While it’s not the most realistic position to have them, I love the look of a Corsair with its flaps hanging down and will build mine like that. Interestingly enough the gun tubes are not modeled by Tamiya. There are just open holes in the wings. I’m a little disappointed in this as that detail is actually very easy to see in this scale. However, a realistic and easy option would be to use decal strips to represent the tape which was typically used to cover the gun ports on operational aircraft. The landing gear parts are exquisite and very well detailed. Other than a brake line not much will be required to detail this area of the kit. Also, they engineered the wells to completely eliminate ejector “pin marks”. The landing gear door bays consist of multiple parts to allow you to construct a very realistic copy of the doors without having to have those pin marks which always ruin the detail. This kit takes a turn from previous 1/32 releases from Tamiya in that there isn’t any armament provided and the wing gun bays are sealed shut. This is good thing for those who complained about the open panels on the spitfire and P-51 kits. This lack of panels to glue and fill will make this kit much easier to build. Like the missing guns, Tamiya provided a nice engine, but none of the accessory package and super charger that was present in the bay just behind the engine. The only engine panels that can be opened are the ones directly over the cylinders. Again, this will make this kit much easier to build than either the Spitfire of the Mustang because there is so much less to deal with as far as panels and internal details. So, while this kit is a simpler (but just as costly) than either the Spitfire Mk9 or P-51D kit, there are plenty of parts and details to keep a modeler very busy for quite a while and will result in a stunning rendition of the first of the Corsairs. I can’t wait to build mine. A PEEK AT THE FUTURE? In looking over the sprues and instructions it’s entirely obvious that there will be other variants of this kit released. The parts breakdown is such that they could pretty easily do all variants of the corsair if they really wanted to, but for sure we should see a F4U-1D at the very least. I say this because the etched sheet contains the rocket motor vents for 8 5” HVAR’s! Highs: High points on this kit are the quality of the moldings and details such as the engine, cockpit, and gear bays. The simplified assembly gives the builder the option to build a detailed model OOB and provides a terrific basis for a more detailed effort. Lows: If you only plan on building one large scale Corsair, most modelers would probably choose the later F4U-1a or F4U-1D variants. Obviously the price is high for this kit. Verdict: This kit meets all expectations. 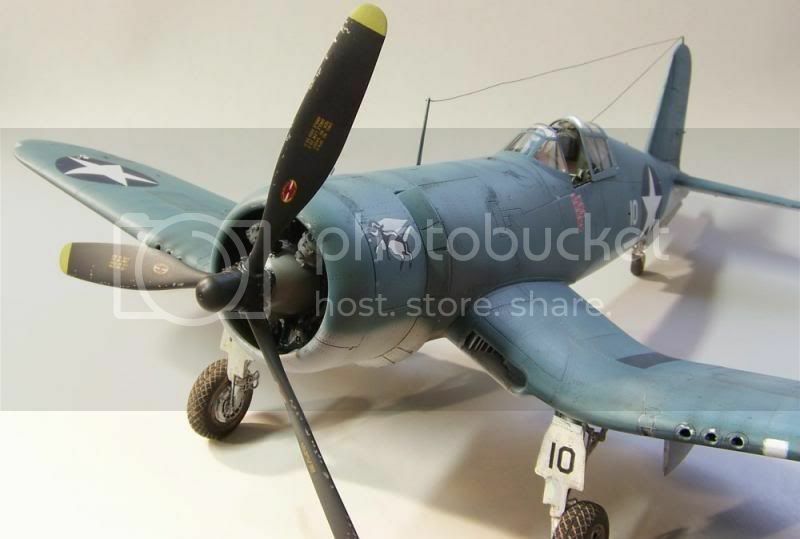 Tamiya's Corsair is an easy to build (albeit costly) highly detailed gem of a kit - the best Corsair kit in any scale by leaps and bounds. If you appreciate quality you probably won't feel the asking price is unreasonable. Copyright ©2019 text by Frank Crenshaw [ FRANKC ]. Images also by copyright holder unless otherwise noted. Opinions expressed are those of the author(s) and not necessarily those of AeroScale. All rights reserved. I feel your pain Rowan but for me a Corsair is a take it or leave it aircraft, and at this time I'd leave it. Don't get me wrong I applaud Tamiya for making it but it's just not for me. I will be buying one but not the birdcage version. I have just completed a set of masks for one of these for Jamie Haggo, you can find him on Large Scale Planes, or is it Britmodeller? and it will appear in one of the magazines From what I have seen it is definitely as good, if not better than any of the Tamiya "super kits", and I look forward to further releases. I can testify..its a beautiful kit! And the fit of the parts is the best Ive ever seen. Yeah, the gray styrene is too neutral. And I'm not odd!